UPDATE 23 MARCH 2015: the recipe for a variation on the another square is available, just scroll down this blogpost ! 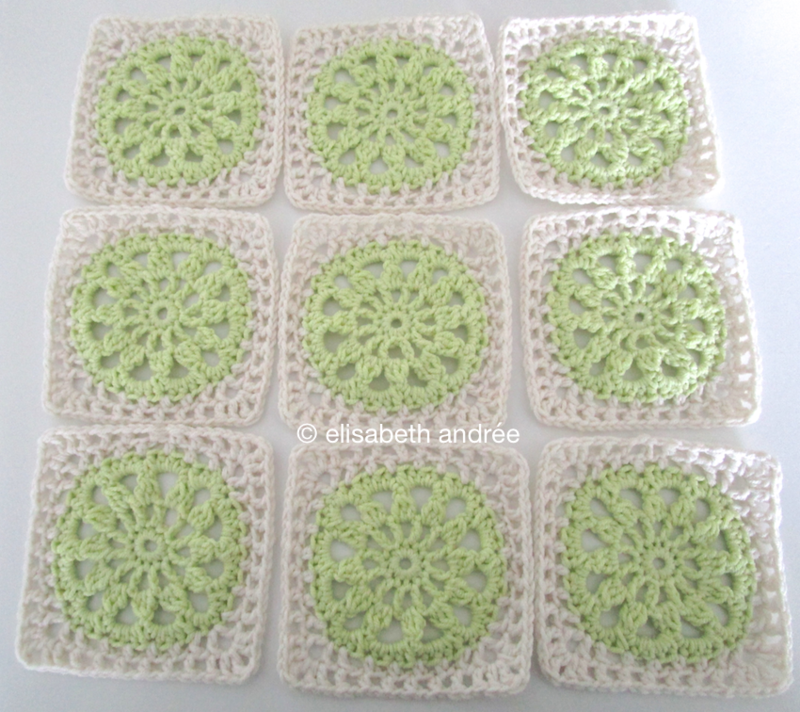 maybe you like to try my explanations on how to make a round motif into a square? in a previous post i showed a round motif that i really like and i regular use for round projects like a cover for a glass jar. i wanted to make a square of it and the pink ones where my try outs. unfortunately i could not remember where i found the pattern but i came across a similar one. click on this link to directly download the pdf. yesterday i made these two, the green one of acrylic yarn with crochet hook size 4.0 mm and the yellow one of cotton yarn with crochet hook size 3.0 mm. – end with 2 ch, 1 dc into first ch of first 5 ch space. row a. 1 ch, 1 dc over dc (of last space), 2dctog (of which 1 dc into same space and 1 dc into next space, see photo below), *3 dc, 2dctog (of which 1 dc into the same space and 1 dc into the next space)*, repeat between * and * until end of row, end with 2 dc into last space and ss into first dc. row b. 1ch, 1 hdc in same stitch as ss, 1 hdc in next 2 stitches, 1 dc in next two stitches, *5 ch, skip 2dctog, 1 dc in next 2 stitches, 1 hdc in next 7 stitches, 1 dc in next two stitches, repeat between * and * until you have 4 corners made, end the row at the last side with 1 hdc in the next 4 stitches, ss into first hdc. row c. 1 ch, 1 dc in same stitch as ss, 1 dc in next 4 stitches, *1 dc, 3 tr, 1 dc all into the next 5 ch space (corner), 1 dc in the all the 11 next stitches until you reach the next corner*, repeat between * and * another 3 times, end the last side of the square with 1 dc in the remaining stitches, ss in first and second dc. and then you can cut the yarn and weave in the ends. hope you wil have a great weekend! if you like, here is a different version of the another square. in this variation the flower motif remains slightly higher than the edge. scheepjes softfun, colors 2426 (off white) and 2497 (light green) with crochet hook size 4.00 mm. more info about the yarn you can find here. 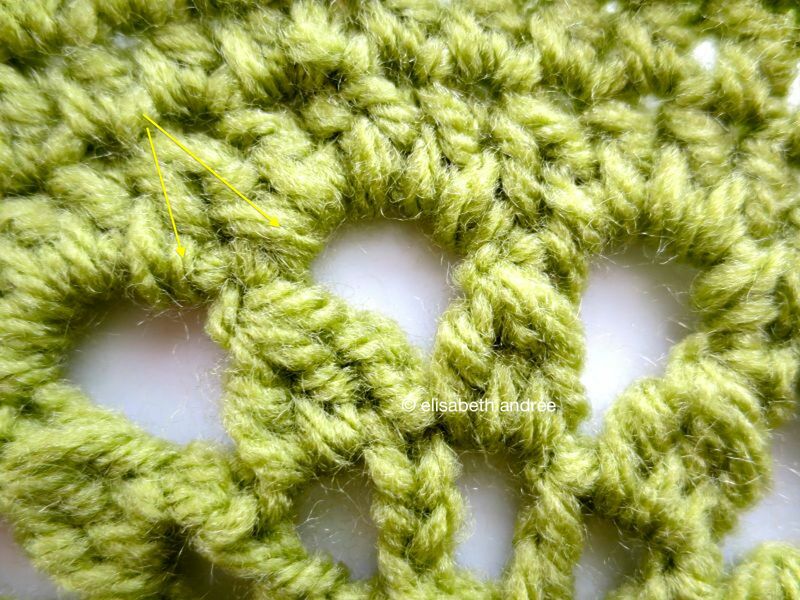 to make it a little complicated you have to scroll up to the instructions for row a. the method remains the same, but you need to replace the double crochets for half double crochets and the 2dctog for 2hdctog. attach the yarn to any hdc right behind a 2hdctog and make 1 hdc in the same stitch, 1ch, skip 1 stitch, 1 hdc in next stitch, 1 ch, skip 1 stitch, * 1 dc in next stitch, 1 ch, in next stitch make 1 dc, 2 ch, 1 dc (= corner), 1 ch, 1 dc in next stitch, 1 ch, [skip 1 stitch, 1 hdc in next stitch] 4 times, 1 ch, skip 1 stitch *, repeat between * and * two times (= 3 corners), 1 dc in next stitch, 1 ch, in next stitch make 1 dc, 2 ch, 1 dc (= 4th corner), 1 ch, 1 dc in next stitch, 1 ch, [skip 1 stitch, 1 hdc in next stitch] 2 times, 1 ch, join in first hdc. the attachment you can remove later when weaving in the yarn ends. an other option is to start this row with making a standing stitch, for that you can find tutorials on the internet. if you don’t start the border with a different color yarn, you can start this row with 3 chains. make 3 ch, skip 1 ch space, 1 hdc in next hdc, 1 ch, * 1 dc in next dc, 1 ch, 1 dc in next dc, make in corner space 1 dc, 1 ch, 1 tr, 1 ch, and 1 dc, 1 dc in next dc, 1 ch, skip next 1 ch space, 1 dc in next dc, 1 ch, [skip next 1 ch space, 1 hdc in next hdc, 1 ch], 4 times *, repeat between * and * 2 times, 1 dc in next dc, 1 ch, 1 dc in next dc, make in corner space 1 dc, 1 ch, 1 tr, 1 ch, and 1 dc, 1 dc in next dc, 1 ch, skip next 1 ch space, 1 dc in next dc, 1 ch, [skip next 1 ch space, 1 hdc in next hdc, 1 ch], 2 times, join in 2nd of beginning chains. weave in yarn ends and you are done. hope you enjoy to make this square! Categories: crochet, tutorial | Tags: crochet, motif, square, squares, tutorial | Permalink. This is a great tutorial! I’m book marking it now! Thanks! Great tutorial! I love this pattern! thank you for sharing these little beauties!!! Mooie foto’s en mooie kleuren, vooral dat groen en geel bij elkaar. Heb het vierkantje geprobeerd, kwam er aanvankelijk niet uit, maar nu ik je beschrijving nog eens overlees, zie ik dat ik ‘end with 2 ch, 1 dc into first ch of first 5 ch space’ gemist had. Thanks for the pattern and tutorial – lovely square!